The landscaping contractor was tidying up around the powerhouse and fashioned us a platform to build our walled bench/ info/ viewpoint – looks good. 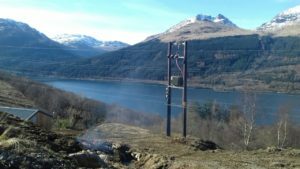 Electrical Engineers from SSE and the Hydro Scheme contractors carried out all the regulatory tests and completed protection measures for the generating equipment and the network this morning, and the G59 certificate has been signed off by both parties. 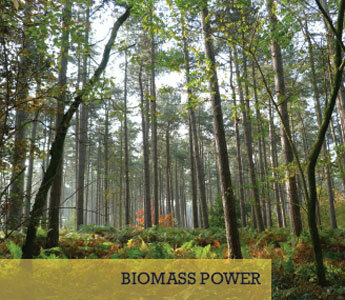 Cameron Consultants have the paperwork and will process the details to Ofgem. All looking good with the system and Highland Eco can concentrate on completing finishing details in preparation for future handover. 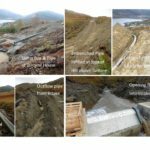 Visiting the scheme at the tail end of Highland Eco’s work on Wednesday, they had flooded the pipeline and left pressure on the valves overnight to test all holding watertight. The final manifold transition piece was delivered and installed to complete the Turbine assembly today. 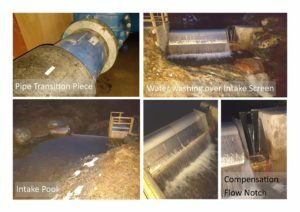 The Intake relief notch was closed off and the water level rose to wash evenly over the full width of the screen to flood the inlet chamber and pipeline. All bodes well to complete final mechanical and electrical, checks and adjustments tomorrow. If air temperature remains above zero the Thrust block can be cast to complete the main build programme. 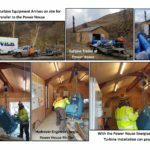 The Hydrover design and Installation team along with Jamie Wallace of Highland Eco arrived early on site to transfer the Turbine equipment to the Power House and commence fitting out work. 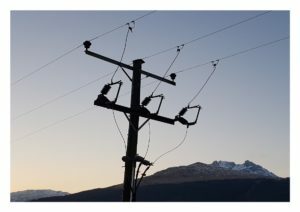 SSE had completed cable works and energised the power supply to the building on Monday. 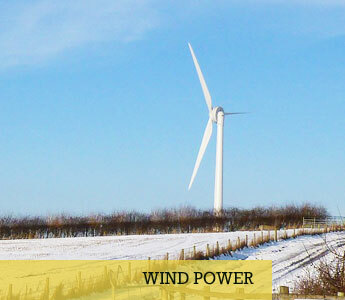 With dry, cold weather conditions with occasional snow flurries, the installation team commenced work, which they anticipate will be completed by the end of the week in readiness for the G59 Mains Power testing, arranged with SSE for Monday 5th March. 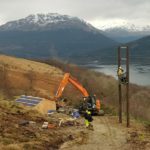 SSE, the Scottish & Southern Electricity Network Company were working over the weekend in preparation from Friday through to Sunday to complete the cable joints and junction Pole work, connecting the power house to the local network. This was completed on Sunday afternoon, with final checks today, before energising the panels inside the power house. With the Contractor returning to site last week we saw further progress in the build up to the arrival of the Turbine next week, commencing 26th Feb.
Network Rail eventually provided approval for work to be carried out under the Railway and the cable was connected on either side of the crossing and reinstatement works completed on a walkers path to the Hillside. 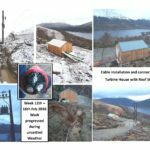 Roof sheeting was affixed to the Turbine House and internal fit out of the Electrical Connections was completed along with cable trenching and connection from to the Transformer Pole, followed again by track and ground reinstatement. As has been the case since commencing work the weather continued to be “changeable” and the week commenced with snow, followed by rain and then more snow. The latter end of the week was a little kinder and the contractor could see better what was being moved around and made good as best they could. Here’s hoping the arrival of the Turbine will coincide with better weather. 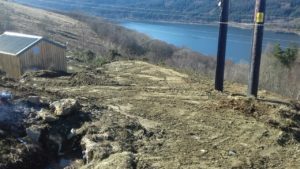 The Helensburgh & District Access Trust who look after the 3 Lochs Way track were pleased with the reinstatement work on the link path to Arrochar affected by the cable trenching work. 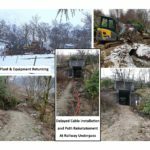 SSEN have outlined that the connection to main line is scheduled for Saturday 24th February. Once this has been connected they will be able to energise the powerhouse. 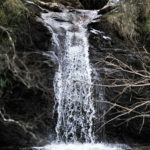 All being well this should work in well for the turbine arrival week commencing 26th February. 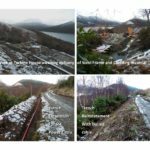 Following a short delay to the Hydro Construction programme due to some wintry weather but mainly due to an impasse between Scottish & Southern Electricity Networks (SSEN) and Network Rail, where the main Electrical cable from the Hydro Turbine Generator was to be run through a Sheep Creep Underpass on the West Highland Railway line. With no agreement coming from Network Rail to plans proposed by SSEN, the Electricity Company withdrew from the site. 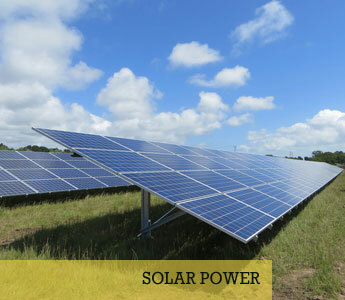 With a tight Construction programme and the date approaching in March when the pre-accreditted Feed in Tariff was due to expire, we called upon local politicians and wrote directly to the CEO’s of Network Rail and SSE appealing for their assistance to resolve the impasse. 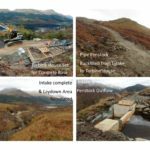 Our approaches were well received and we had a number of calls of support and acknowledgement, with assurances that everything would be done to move things forward. Good to their word both organisations responded and progressed to a site meeting that was held this week. Engineers discussed options and agreed on a methodology that would allow the cable to pass under the railway. SSEN are now due to resume work on Monday 12th February which they hope will allow them to finish all their terminations by Wednesday. Other Progress from the Construction contractor will also resume next week and with roofing materials eventually delivered, the building’s roof will be finished by Friday. Internally Electrical Junction Boards, meters and control equipment will be installed to tie in with SSEN’s external cable connections. 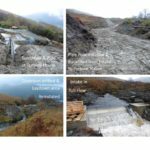 Completion of the Thrust Block and Penstock Valve will also be completed during the next two weeks and all going to plan, the Turbine is scheduled to arrive and installed on week commencing 26th February, with testing and commissioning to follow immediately, as the Hydrover Turbine engineers wish to complete their work on one trip North from their Bridgend Works in South Wales. 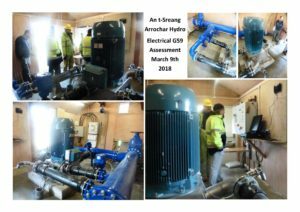 Off site from the Hydro works BenCom Directors, Jim Lee and Duncan MacLachlan of the Hydro Society arranged a meeting with interested local residents who would wish to help in the ongoing Operation and routine Maintenance of the Hydro scheme. It was called at short notice and a few apologies were received. However, we had expressions of interest and support and have compiled a list that we will keep in touch with and be able to invite to induction and training events. 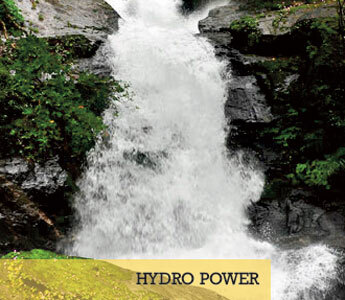 These HYDRO HELPERS or Volunteers, will supplement professional engineering services that will oversee commissioning, specialised Operation and Maintenance procedures, as required by manufacturers recommended Service and Warranties. 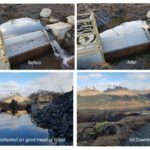 One task envisaged is walking to the upper Intake to sweep grass and waterborne debris from screen that will reduce water flow and generating efficiency. Another associated activity recently was hosting two University Students from Electro/Mechanical faculties, who were keen to see the scheme and follow it’s future progress which Directors Jim and Duncan were keen to support. Especially when we found out that one student was a Shareholder! A filled roll and mug of tea was served up at the nearby Community Cafe in recognition of his VIP status. The undergraduates were also involved as STEM Ambassadors, where they visit and work with school pupils to raise awareness of career prospects that follow studies in Science, Technology, Engineering and Mathematics. Discussion with the local school Head Teacher to introduce the students to P6 and P7 pupils to convey the principles of Hydro and other renewable energy sources. A funding application to E.ON for available grants has been made to see if project packs, posters and other educational resources can be purchased to enhance presentations, pupil engagement, interest and understanding. Word is expected back by the end of February. 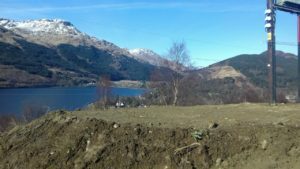 Duncan has also had talks with another voluntary organisation, the West of Scotland Dry Stone Walling Association, (http://www.wsdswa.org.uk/) and their chairman, John New, visited the site along with a local stone waller. 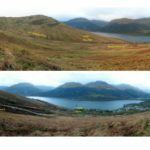 They have agreed to build an enclosed stone and slate bench, and viewing area, with information plinths adjacent to the Turbine House, for walkers on the long distance 3 Lochs Way walk to rest, take in the scenery and learn about the Hydro Scheme and local heritage. 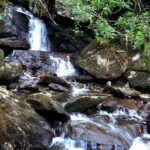 The Landowner Luss Estates has agreed to provide stone from old walls on the estate nearby that have fallen into disrepair or in danger of collapse. Elsewhere legal fees have been received for the completion of the lease, slightly higher than budget, however with construction work going well it is hoped contingency funds will cover their costs. 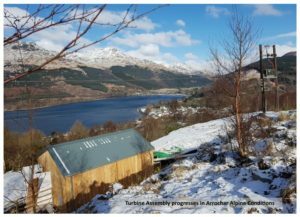 Transfer of scheme ownership from the Arrochar & Tarbet Community Development Trust to the Arrochar Hydro Society has mainly been completed with the Ofgem FIT now being addressed. 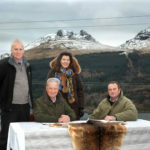 Company Secretary Annette Heslop has sucessfully negotiated settlement of the Project Development Loan provided by Local Energy Scotland and responsibility for the scheme now rests wholly with ACHS. 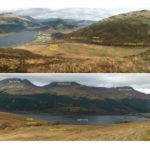 The two Development Trusts in Arrochar and Luss who are to benefit from the Hydro Scheme are represented on the Board of Directors and both Duncan and David MacCowan attend all progress meetings and events. 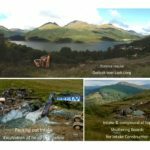 Landowner, Luss Estates through their CEO, Simon Miller, take an active interest in project and Simon joined us on site last week following a Progress meeting and Report No 15 with Marc Blair of GCC and Duncan Legate of Highland Eco Design. With progress generally on track the board are beginning to look ahead beyond commissioning and thinking on how to open the project – more on this later. However, should anyone wish to attend or be involved, please drop us a note, to ensure we don’t overlook the valued support provided by shareholders. Result, following a few weeks effort contacting a number of politicians and Company Chief Executives ! 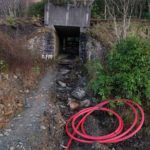 – We’ve just had a communication from SSEN (Scottish and Southern Electricity Networks) that Network Rail have agreed to be on site to supervise cable installation works on Mon 12th / Tues 13th Feb at the Railway underpass. 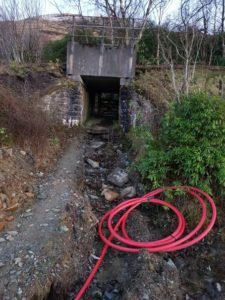 Highland Eco Design’s Civil works contractor will now be re-mobilised to be on site for this work and will remain on site to complete SSEN cable trenching work at the Turbine House and at the junction Pole, at lower end of the track. SSEN will also have engineers on site over this period in order to complete all necessary 11Kv cable connection work ! 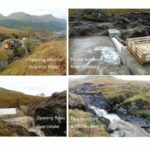 This is great news and will allow the remainder of the Hydro Scheme contract work to progress, within a timescale that will allow us to generate electrical power, that can be exported to the National Grid at the pre-accredited Ofgem Feed in Tarif. Thanks to those taking up our case and bringing pressure on appropriate contacts at both SSEN and Network Rail that elevated the priority being given to this work. 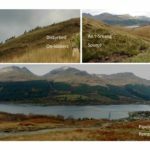 We look forward now to successfully completing the project and generating electrical energy from (in recent months an abundantly available) renewable source, that we envisage from predictive modelling, will bring community benefit into the lochside communities of Luss and Arrochar, in gradually increasing amounts for the next 40 years and …. hopefully beyond. We will keep you informed on further progress and when all commissioning and snagging is completed, on opening and launch events. The uptake and support in helping to resolve the Railway Underpass Impasse was very much appreciated. Due to snow and ice on the road, there hasn’t been a huge amount of progress over the past couple of weeks. However, it has provided some nice winter scenery when the clouds eventually cleared. We also had some interesting visitors on site including the new CEO of Scottish Renewables who walked up to the Powerhouse site on a very wet morning and fully appreciated the hydro potential of the project. 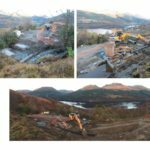 Claire Mack was accompanied by the Loch Lomond & Trossachs National Park Head of Planning and Community Resource who was pleased with how the contractor had tried to minimise environmental impact and comply with planning control measures. 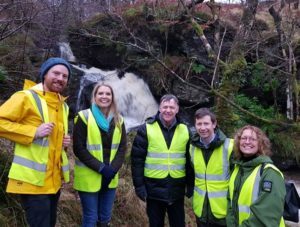 L to R pictured beside the An t-Sreang water in full flow : Duncan Legate (Highland Eco Design); Claire Mack CEO Scottish Renewables; Jim Lee E4A and ACHS; Stuart Mearns LL&T NPA (Head of Planning and Rural Development) and a colleague from Scottish Renewables. Thanks to all members returning votes on line, apologies prior to Saturday and special commendation to those who came along from furthest afield to meet our Energy4All representatives, local members and other supporters of the renewable Cooperatives community, it was a pleasant experience and very encouraging from the response and input received. Thanks also to Isobel and David from the experienced Midcounties Cooperative, operating since 2005 offering a broad range of member services, Stephen and Alison form Edinburgh Community Co-ops, which with another David from Helensburgh we had a good cross section of members from the length and breadth of the country and the Energy4All renewables community, which as novices we very much welcomed for our first AGM. 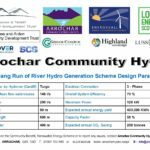 The Arrochar hydro scheme, an ethical source of renewable energy providing a long term sustainable benefit to the communities in Arrochar and Luss, struck a chord with the belief in and support of the co-operative movement, and engagement with communities having active member democracy. 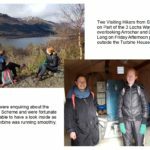 Something Isobel and Alison travelled to Arrochar to demonstrate and be part of, which was very much appreciated. With Energy4All’s administrative preparation and on-line support, the business of the meeting was well prepared and with Company Secretary Annette Heslop fronting proceedings, all motions were explained and carried on the day, with only a few abstentions and one opposing vote from the members present and those submitting returns on-line in absentia. 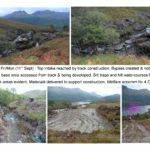 All then depends on the continued construction of the scheme which was reported to be “on time and on budget” despite the continued adverse weather conditions, which had the contractors travelling through a snow whiteout on Friday to get to Arrochar from their base in Perthshire and then working through snow, rain and sleet showers to excavate cable trenches from the Turbine House to the SSE Junction pole beside the 3 Lochs Way Link path from behind the Arrochar Parish Church.At the meeting the Founding Directors of the Hydro Society welcomed the ongoing support of local members and the inclusion in future of co-opted Directors with appropriate knowledge and experience, Social Enterprise Advisors and Volunteer supporters to reduce operational and routine maintenance overheads, to maximise community involvement and financial efficiency for community benefit. 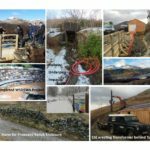 Next week will see the arrival of the Steel frame and wooden cladding (and insulation) with roof sheeting for the Turbine House to prepare for the delivery of the Hydrover (www.http://hydrover.co.uk/) Turbine and generating equipment. 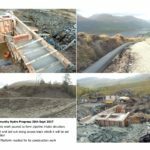 This will also see the civil contractor Bryan Construction finishing their ground works which we have very much appreciated and despite variable “Good Hydro” weather they’ve completed as planned. Please click on the galley image to view the pictures and text from the weekly overview. 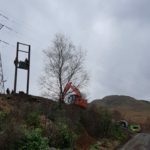 Update 24th November – Cable laying.